WindowSeal® Window Flashing is a 20 mil self-adhering, self-sealing, waterproofing rubberized asphalt tape, laminated to polyethylene film. The coating is supplied in rolls, with an easy to remove film release liner, used to strip in or flash window frames, door frames, and other construction seams. Tapes are used to strip in or flash straight window frames, door frames, and other construction seams. Butyl Flash is a self-adhering, self-sealing tape consisting of rubberized asphalt waterproofing coating, laminated to polyethylene film. The coating is supplied in rolls, with an easy to remove film release liner. Butyl Flash is available in 20 mil thickness and a variety of roll sizes. Used to strip in or flash straight window frames, door frames, and other construction seams. Aluma Flash™ is a self-adhering, self-sealing tape consisting of rubberized asphalt waterproofing coating, laminated to polyethylene film. The coating is supplied in rolls, with an easy to remove film release liner. 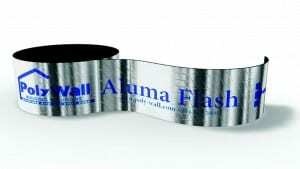 Aluma Flash™ is available in 20 mil thickness and a variety of roll sizes. Aluma Flash Plus is a rubberized asphalt waterproofing coating, laminated to two layers of high strength polyethylene film, with a top protective layer of aluminum. The coating is supplied in rolls, with an easy to remove film release sheet, for easy application. ArcFlash is a 70 mil self-adhering, self-sealing waterproofing rubberized asphalt tape, laminated to a crimped and stretchable, high-strength polyethylene film backing designed specifically for arched window flashing applications. Time proven adhesive and primer works well in most conditions to assist in making your window flashing adhere to your substrate. Polybond Clear Liquid Adhesive is a solvent based product to use when adhering window flashing tape is difficult. Available in 1 and 5 gallon containers.